It’s legacy format, and you’re playing with a blue/green home brew that you’ve managed to dug up in your card pool. You’re paired against an elite player, playing a “Show and Tell” variant deck. On his turn, he cast Show and Tell, and it resolves. As he dropped Progenitus, and you dropped Simic Sky Swallower. You frowned a bit as you have no way of dealing with Progenitus, except for your lone Upheaval in the deck. Your turn came next, and you drew a card. You peeked a bit, hoping it would be Upheaval. But instead, it was Progenitor Mimic. Alas! A ray of hope to deal with the rampaging hydra! So let’s take at some few rules to see what happens. Let’s say you chose to copy Progenitus with your Progenitor Mimic. What happens here? 704.5k. If a player controls two or more legendary permanents with the same name, that player chooses one of them, and the rest are put into their owners’ graveyards. So Progenitor Mimic becomes a copy of Progenitus, and then nothing happens. Oh well, at least you get a Progenitus in the process. Back in the day, when there are two or more legendary permanents with the same name in the battlefield, they will be put into a graveyard as a state-based action. This isn’t the case anymore. But wait! Progenitor Mimic has a cool ability when it copies something. At the beginning of your upkeep, if this creature isn’t a token, put a token onto the battlefield that’s a copy of this creature. So your Progenitor-Progenitus will spit out a token that’s also a Progenitus! So what happens here? We refer to 704.5k above. So you’ll choose one one Progenitus that you control, and the rest will be put into their owner’s graveyards. In this scenario, you’ll probably put the token instead of the original. 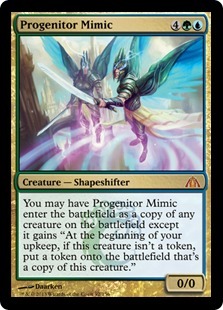 But what if we chose to copy the Simic Sky Swallower instead of Progenitus? Is this possible?